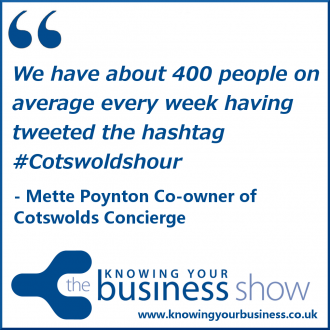 We talk with Mette Poynton the Co-owner of Cotswolds Concierge about business in the Cotswolds and the phenomenon on Twitter – the hashtag #Cotswoldshour. They use the hashtag to support and promote local businesses in the Cotswolds every Wednesdays from 8 to 9 pm. The Cotswolds Concierge is a personal Online guide to the Cotswolds by professional Head Concierge of over 30 years, Kim Poynton and his Danish wife Mette. The Biggest and Best Guide to The Cotswolds, with the tagline – Bringing The Cotswolds Together. Mette also helps run the now famous Twitter hour #CotswoldsHour. News, views and information from the beautiful Cotswolds in what’s known as a Twitter chat hour. The idea is to support and promote local businesses. Join them on Wednesdays, 8-9pm. The Hour That’s More Than An Hour. Managed by @t20media and @CotswoldsConcie. 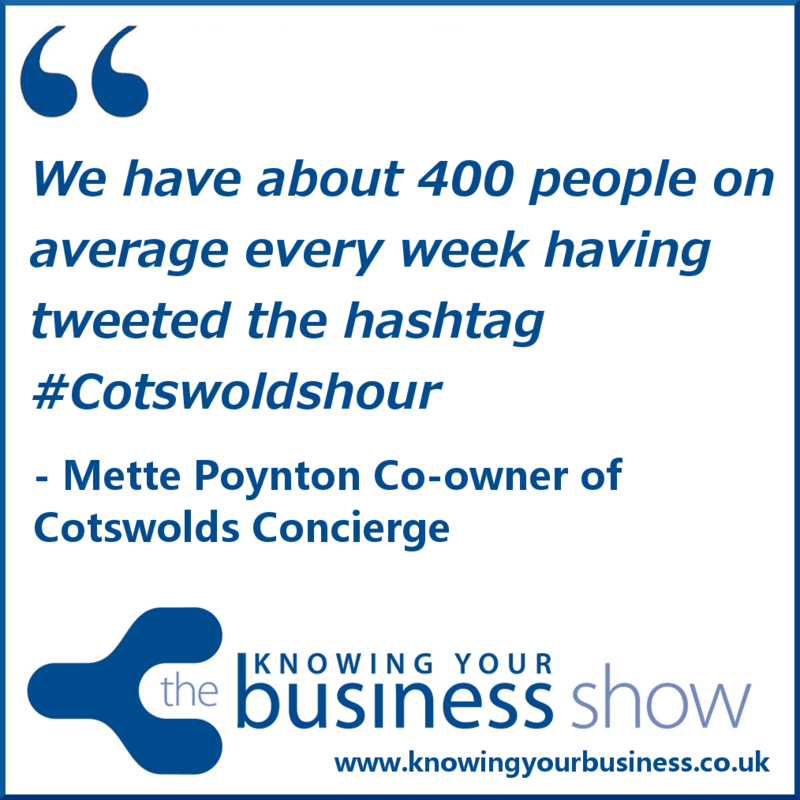 Mette explains in this 30 second clip that the Twitter hashtag #CotswoldsHour is enjoying some excellent feed back with businesses gaining work from participating in its phenomenon. If you have any questions for Mette or would just like to leave a comment, please do.